Chimney Repairs | Chimney Repair | Chimney Sweep | Kent Chimney Inc.
Chimney repairs are important because they decrease your risk for a chimney fire and ensure your chimney remains operational when you want to use it. No homeowner wants to deal with chimney collapse or other expensive chimney repairs. During the winter months, warm air can escape out your chimney and transfer with the cold air from outside. In order to stop cold air from seeping into your home, we recommend calling one of our chimney repair contractors. They will be able to determine an affordable solution, such as installing glass doors in front of your fireplace. We fix many types of chimney damage such as a cracked chimney liner or a crumbling brick chimney. It’s better for us to catch chimney damage early on so you don’t have to pay for expensive repairs later. The sooner we catch an issue with your chimney, the less expensive the repair. Kent Chimney Inc. is a chimney repair company dedicated to helping homeowners keep fireplaces and chimneys safe and in working order. 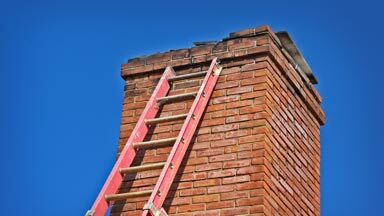 If you are interested in our chimney repair services, call us at (616) 949-7722.